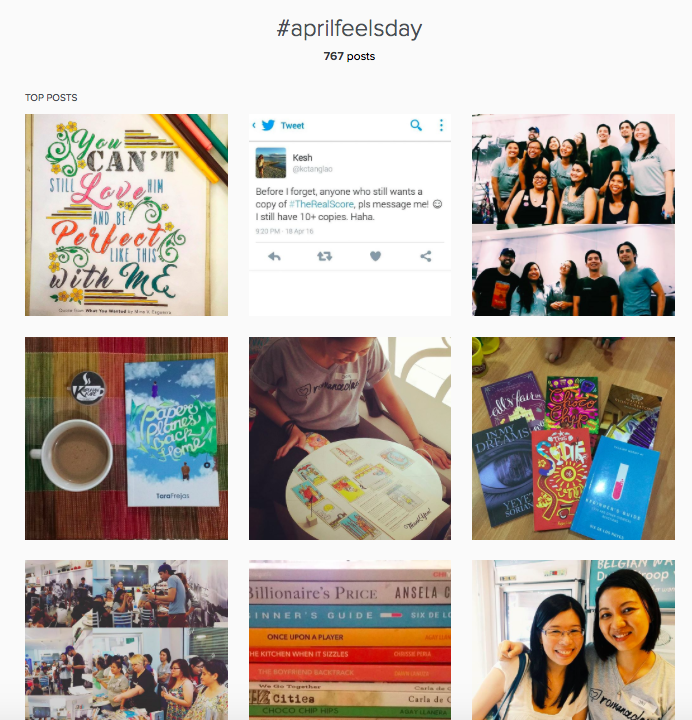 The #AprilFeelsDay tag on Instagram is my happy place right now. It’s a collection of photos taken during the event, and I was there, but I was running around and constantly thinking of what was to happen like ten minutes into the future, so I couldn’t exactly be in the moment. We in the #romanceclass (romance in English by Filipino authors) community planned #AprilFeelsDay as a next step, after participating in several events as the “romance people.” We’ve done small-scale meetups and private gatherings, but haven’t yet organized an event that was open to the public and made everyone who attended “romance people” by default. Summer was as good a time as any to do it, so we chose April 17 as the day. 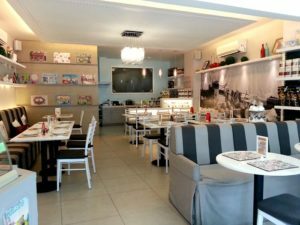 After considering various venues and cities, we decided on Pegi Waffles in San Juan. It’s a little out of the way but it’s a cute spot with great food, and on a normal day looks like this. Still cute, but also packed! In the summer! We sold books. Indie authors side by side with traditionally published romance authors. We met and hung out with readers and authors…well, they did. I was running around and didn’t get to talk so much. There was an entrance fee of P200 but we were able to give everyone who showed up a free book, courtesy of our friends at Anvil Publishing, Visprint, Summit Media, and also the indie authors who provided copies of their books. We wrapped them up and gave them out like this, so readers get a nice surprise and maybe discover a new author. The afternoon started with a tarot card reading session by author C.P. Santi that continued for most of the program, while it was happening. She talked to 15 people! She also created the coloring pages that featured quotes from our books. So awesome, and also a surprise to us because she only mentioned it like a day or two before! After a quick talk on romance writing and publishing by me, we moved on to a reading of poems by Pierra Calasanz-Labrador, from her book The Heartbreak Diaries. Herv Alvarez and Salve Villarosa each read one. 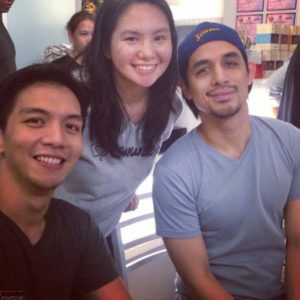 Then, the live readings! This is the third time that we’ve staged a live reading, and this was probably the largest audience so far. It’s always fun. Salve and Herv read excerpts from three YA stories. Settle the Score by Tara Frejas, Picture Me Naked by D.R. Lee, and Choco Chip Hips by Agay Llanera. Audio recordings of these and more will be available on romancepodcast.com soon. Next up, adult contemporary romance! We prepared two sets to be performed. Rachel Coates and Jef Flores read from That Kind of Guy (by me), One Night at the Palace Hotel by Bianca Mori, and Songs to Get Over You by Jay E. Tria. We already recorded Rachel and Jef reading from five books actually, and that’ll be romancepodcast.com’s season 3. After a quick break came our last set, performed by Rachel Coates and Gio Gahol. They read Welcome to Envy Park (by me), The Real Score by Kesh Tanglao, and All’s Fair in Blog and War by Chrissie Peria. These and two more titles were recorded by Rachel and Gio and will be the podcast’s season 4. I don’t think I’ll ever be able to explain what it’s like to be at a reading. Especially when the people there like to read the things you like to read, and you chose scenes that you love and maybe they’ll love, and you get actors who are oozing with charm and talent. Add to that the sweltering summer we’re experiencing, the airconditioning that was trying its hardest to cool down the people packed into the restaurant…well. Click on one of the videos, or all of them, to see how it went? There was squealing, squeeing, giggling. The joy that bubbles up whenever we do this is invigorating. I’ve said this before and I’ll say it again: the value to me of the live reading is that we get to experience our work. Also, when it’s good, we instantly get schooled on what’s good. 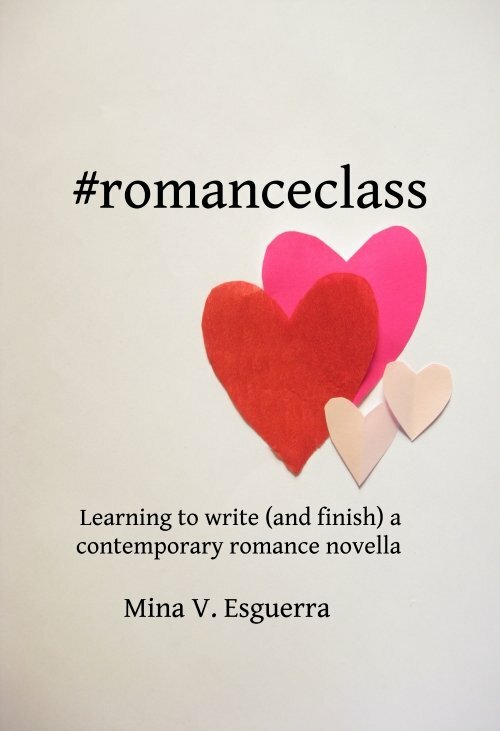 Romance writing can be very personal, and also very solitary, and even when a book comes out you are rarely with the reader seeing how they react to specific parts. I have fun with the podcast and readings because I get to choose the books and the scenes, and when the scene is performed, I instantly make notes. Wow why is that good? Why do I love this part? What makes it so so fun? Shouldn’t he have said something here? Stuff like that. Thank you, Herv, Salve, Rachel, Gio, and Jef for all of that. But I tried to keep it short, when I concluded the day. I just said something like: I hope this afternoon inspired you to write the stories that we’ll love. I hope the waffles were yummy. After the program, some of us who organized #AprilFeelsDay stayed behind to talk about how it went, what worked, what to do next. And the decision was, we should be doing this again, and other things. Sometimes because of what we write we feel like such a niche (in terms of genre, language, nationality of the authors) but I never doubted that the readers were around — I just felt we needed to tell them HEY, COME OVER! FUN STUFF HERE! and they did! Signing off with my favorite picture. The Ethan (from Welcome to Envy Park) and Anton (from That Kind of Guy) in my head don’t look like these guys, but who cares. They’re my Ethan and Anton now, haha. *Shirts by WearDPT. Books in ebook and print listed at romanceclassbooks.com.